In Australian media news this week, Fairfax Media and Mi9 team announce a mobile programmatic advertising joint venture, rumours Microsoft has fired its entire global ad sales team, Mashable launches an Australian version of its site, The Today Network makes some 2015 line-up announcements, Qantas launches a new in-flight entertainment program, and News Corp promotes subscriptions with a new digital outdoor campaign. Fairfax Media and Mi9 have announced a joint venture to serve mobile programmatic advertising, Australian Premium Advertising Exchange (APEX). The company, which will launch in 2015 under CEO Pippa Leary, will offer real-time bidding powered by AppNexus advertising technology. APEX will serve advertising to more than 50 local mobile sites and apps including Fairfax and Mi9 properties, as well as third party publishers such as Daily Mail Australia. Marc Barnett, Mi9 Chief Operating Officer and APEX chairman says the new mobile exchange will give advertisers a single platform on which to execute campaigns on a large scale. The Australian programmatic market is forecast to grwo to $1.4 billion by 2018. Microsoft has laid off its entire global advertising division, affecting about 100 staff around the world, Business Insider is reporting. The staff cuts form part of the 18,000 jobs Microsoft has said it will shed in the next year. Microsoft’s advertising staff were responsible for selling space on MSN, Bing, Xbox, Outlook, Skype and Windows 8 properties. Mashable has launched an Australian version of its website, which defaults for users within the country visiting mashable.com. The Australian site is Mashable’s first country edition and is headed up by Jenni Ryall based in Sydney who joined the company in June. The technology website also plans to launch Mashable UK in the coming months. 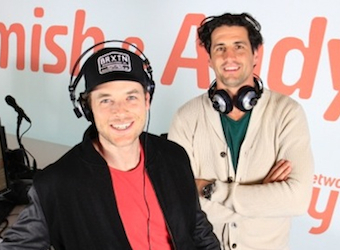 Dan and Maz will host 2Day FM breakfast from January. Qantas is improving its in-flight entertainment following new partnerships with Sky News, Foxtel and Fox Sports. Customers in all classes will now have access to multiple daily news updates seven days a week, 100 hours more TV and movie content, 160 hours of box set viewing, triple the number of new release albums and double the number of blockbusters. Foxtel will provide access to shows including Selling Houses Australia, Grand Designs Australia, Coast Australia and a variety of music and entertainment shows. Stellar Entertainment is the company to provide Qantas’ in-flight entertainment service. 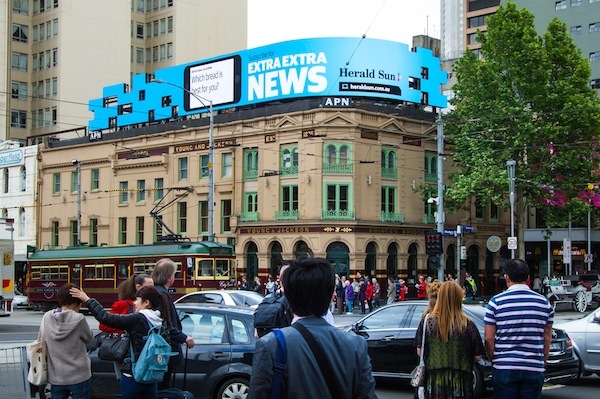 News Corp has teamed up with Um and APN Outdoor to launch a digital outdoor campaign across Sydney, Melbourne, Brisbane and Adelaide. The localised, real-time campaign uses RSS feeds to show real-time sport, news and entertainment updates. News Corp’s goals are to promote the benefits of paid digital subscriptions and increase subscriber numbers. The campaign will also feature on the newly launched XtrackTV train station advertising screens in Sydney and Melbourne.